Fabio Scherer experienced a weekend of highs and lows in the FIA F3 European Championship at Silverstone this weekend, achieving the first pole position of his rookie F3 career but then suffering cruel luck that robbed him of a podium finish. 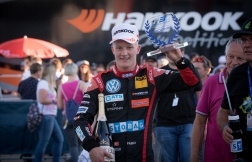 The 19-year-old travelled to the home of British motorsport in a confident mood and, after qualifying P11 for race one, he claimed a sensational pole position for race two. Fabio, who hails from Switzerland, guided his Team Motopark-run car to a P10 finish in race one on Saturday morning. 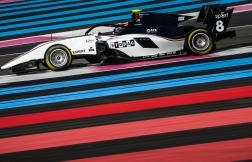 During race two, however, the thrill of qualifying on pole was followed a crushing low as a rare technical fault struck his Dallara-Volkswagen and forced him to retire from a podium position. “I was struggling a little with race pace, but I was lapping strongly enough to finish P3. Unfortunately my car suffered an electrical issue that affected the gear change,” Fabio explained. “Before I had to stop the car I could feel that something was not right, it felt like it was not shifting gear cleanly. Fabio’s luck didn’t improve during the third and final race of the weekend on Sunday, despite his best efforts to make progress: “My start was spot on and I moved up to P10, but we didn’t have the ideal balance in the car and that made it a bit of a struggle to make up more places. 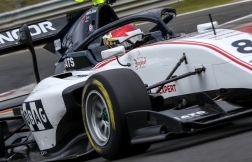 Fresh from finishing P11 in his third race at Silverstone, Fabio vowed to continue to work hard to make progress during the four remaining FIA F3 European Championship events of the 2018 season. “I’m not happy with what we’ve achieved at Silverstone. A pole position and one championship point is much less than we deserved and we must redouble our efforts to move forward,” he said. 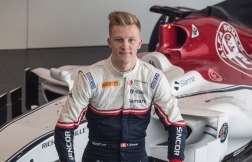 Fabio already has valuable circuit knowledge of the Misano circuit, having successfully participated in the pre-season F3 test there back in April.